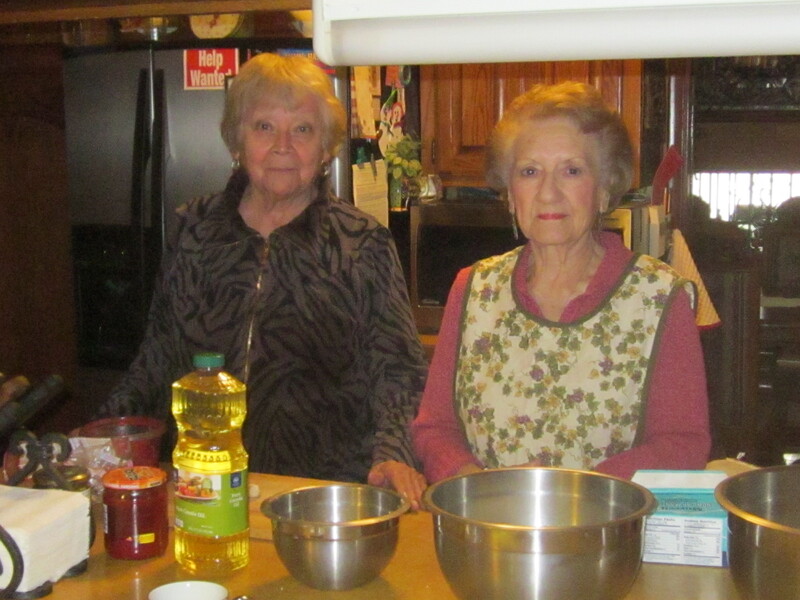 Elda Islas and Armida Islas are sisters-in-law who make Sonoran flat enchiladas according to directions handed down by Elda’s mother and their mother-in-law Josefa Islas. Hello. It’s Carolyn here with you this week. First I want to welcome all our new followers. Always feel free to leave a note, an observation, even a qibble. We want this to be a community conversation. When I heard that Slow Food was considering nominating Sonoran flat enchiladas as a vanishing food tradition, I knew exactly where to go to document what in the Islas family is a recurring staple. Elda Islas and Armida Islas are sisters-in-law who are married to brothers who ran the American Meat Company on South Fourth Avenue in Tucson. Their families and their husbands go back many generations in Tucson and Sonora. Elda’s husband Filiberto told me that Sonoran flat enchiladas were traditionally served on Fridays when Catholics were prohibited from eating meat. Since fresh fish wasn’t always available in the desert, this was a hearty substitute. For our lesson, we met one afternoon last week in Elda’s comfortable kitchen in the Menlo Park neighborhood in Tucson. 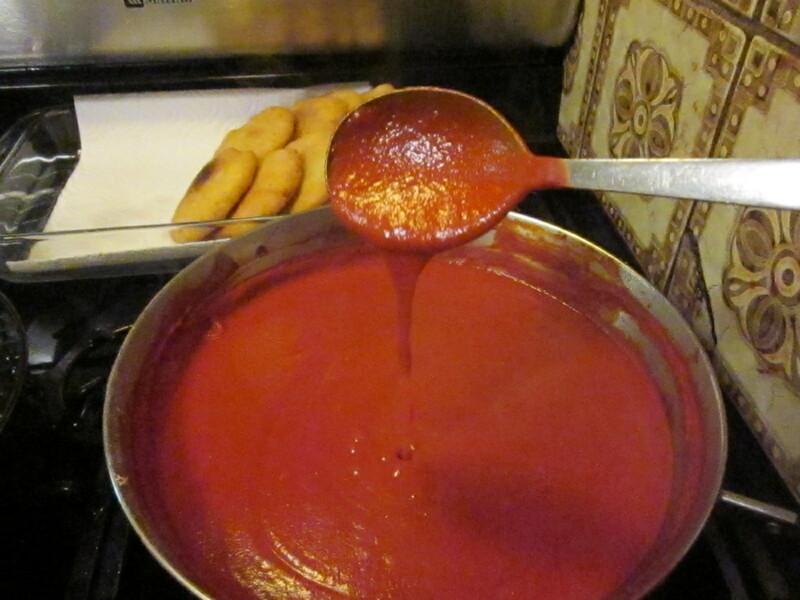 First we made the chile sauce. 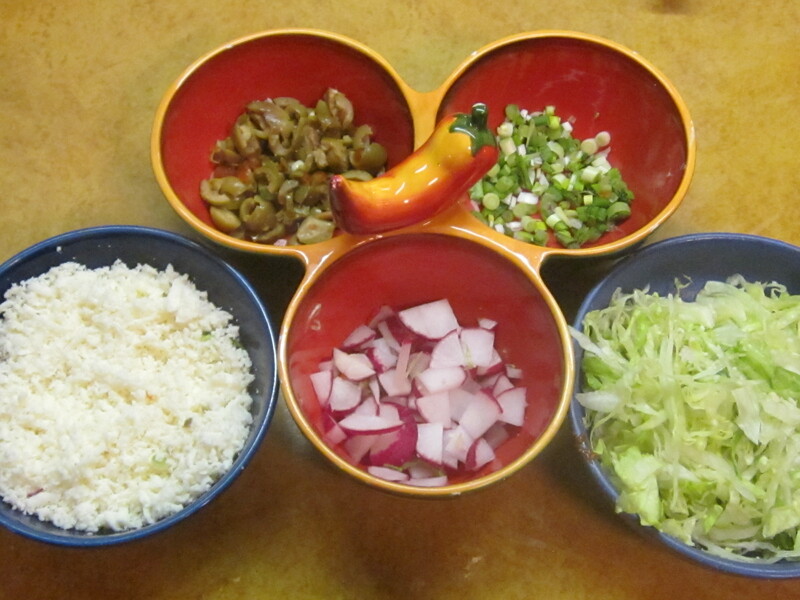 In this case, we used fresh chile paste prepared from plump red chiles by Filiberto. But you can also use canned Las Palmas chile or Santa Cruz chile paste. 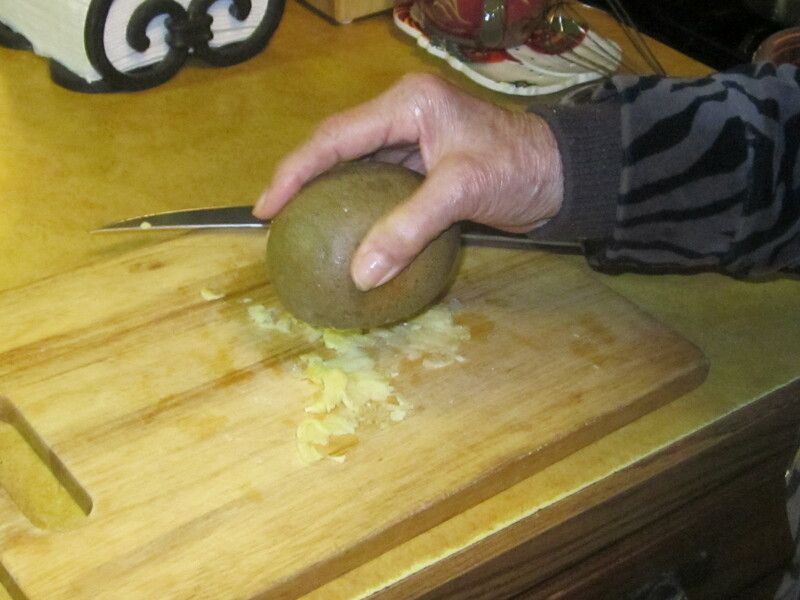 Elda began by smashing some garlic with a stone with a flat side she had inherited from her mother-in-law. It has been used by generations of women and has grooves worn where the fingers grip it. 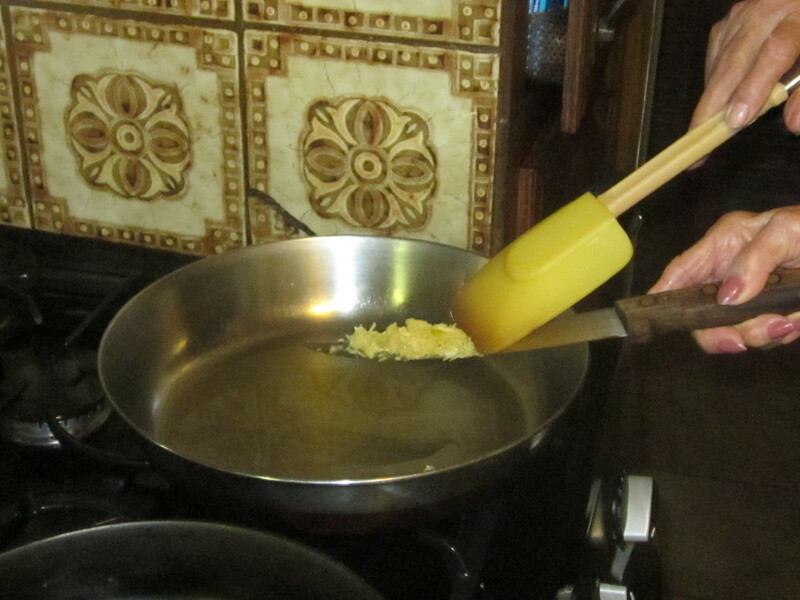 Then we browned the garlic in a little oil. Smashing the garlic with a stone. Brown the garlic in a little oil. Next we added 3 tablespoons flour, the 2 cups of chile paste and a little broth and let it simmer gently. The chile sauce should be thick but fluid. Next we made the masa. She used lard which recent studies have shown is not as bad for you as Crisco. Armida mixed it with her hands. 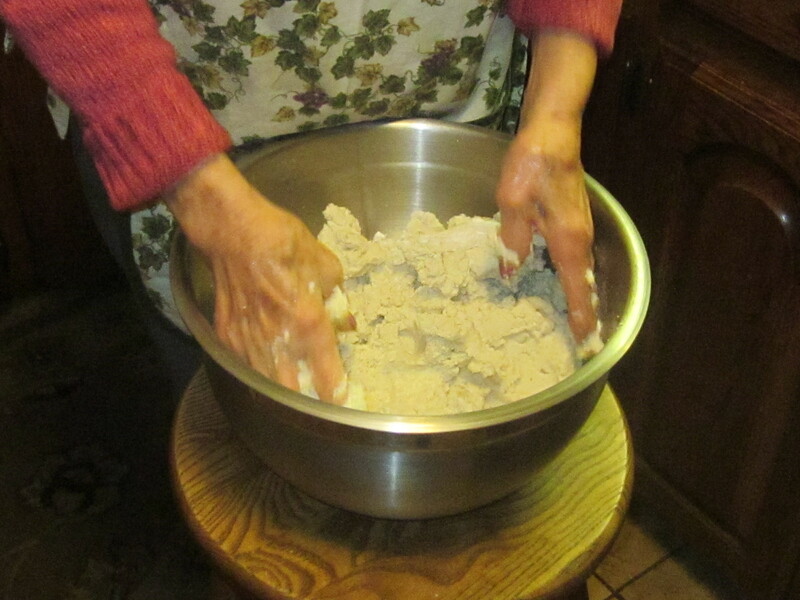 Combine all in a deep bowl and knead with hands until thoroughly combined. It should be creamy, damp but not sticky. 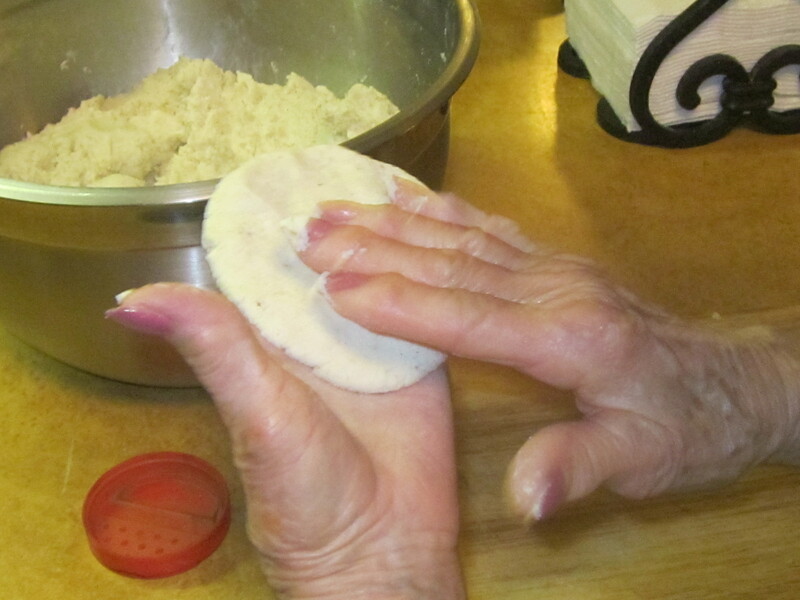 When the masa was ready, we formed it into patties 1/4- to 3/8- inch thick and 3 to 4 inches in diameter. Meanwhile ½-inch of vegetable oil was heating in a heavy frying pan When it was hot (didn’t have a thermometer, but probably around 350 degrees F.), Armida slid in three patties. A bigger frying pan could probably accommodate four. 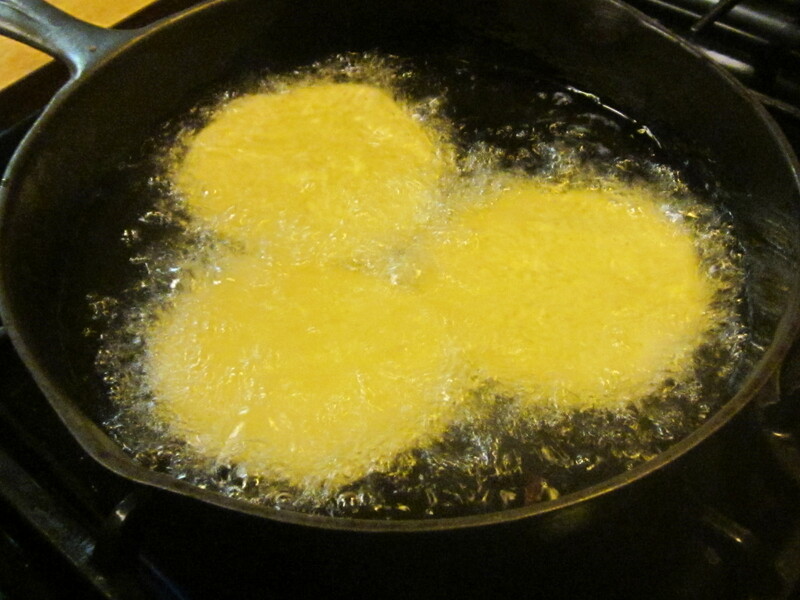 She fried them until they were golden on the underside, about three minutes. Then she turned them to fry another 2 to 3 minutes until golden. She lined a oblong dish with paper towels and stacked the finished patties to drain. Eventually we ended up with 3 dozen patties. The patties should be crispy on the outside and light on the inside. Now it was time to assemble the enchiladas. 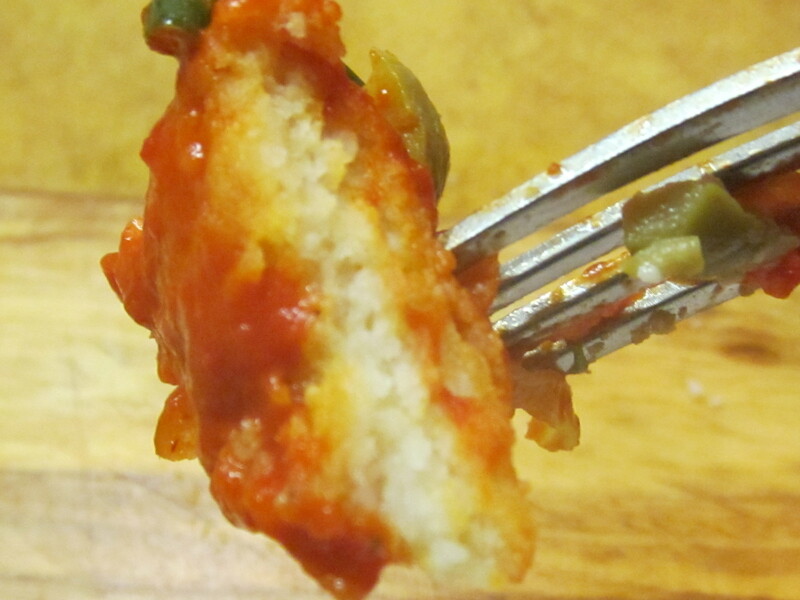 Armida dipped each patty in the chile sauce and arranged them on a plate. Then it was time for the condiments. We used lettuce, grated queso fresco, chopped green olives, radishes, and chopped green onion. When the Sonoran flat enchiladas are assembled, they look like this. What is missing from the photo is the aroma. Heavenly! Three enchiladas made a nice meal. You can also add beans and rice. 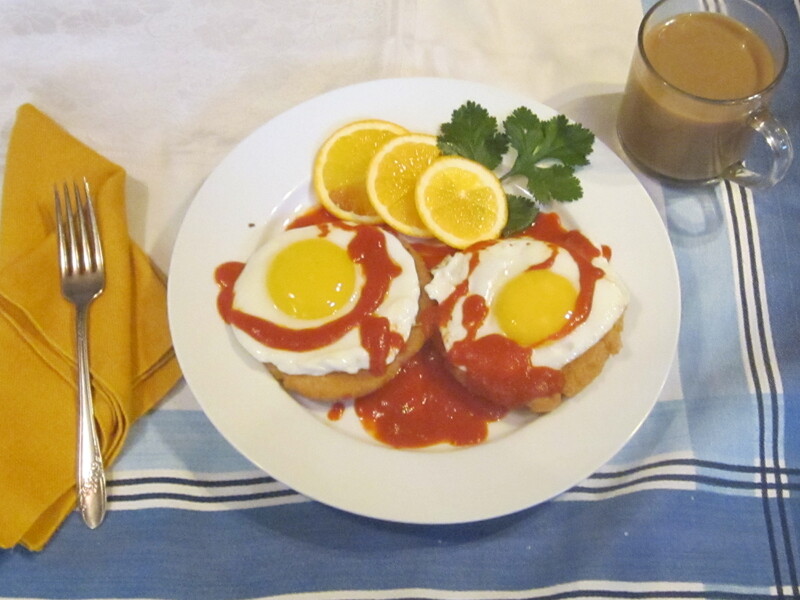 Should you have any leftovers, they are great warmed up and served for breakfast with eggs. 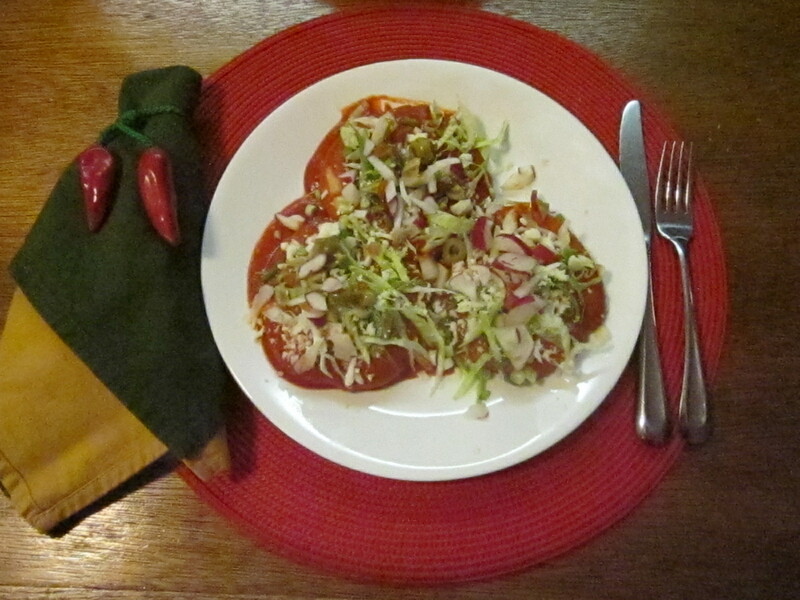 Filiberto Islas said this is called Enchiladas de Caballo. My sincere thanks to Elda and Armida for the lesson and a lovely afternoon! Want more recipes for delicious food with a Southwest twist? My book The New Southwest Cookbook contains recipes from top restaurant and resort chefs throughout the Southwest, using our local ingredients for mouthwatering dishes. You can find it at your local bookstore or order it here. See all my cookbooks at my website. These were the weekly special at the lunch counter at Sant’s Drug in Yuma, Arizona, in the 1960’s. So glad to find this recipe! At Sant’s, cottage cheese was used … we didn’t have queso fresco or cotija there back then. Can’t wait to make this blast from the past. Glad this brings back memories. Of all the wonderful recipes from so many fascinating foods we’ve had on the blog over the past 3 years, this is the most popular of all our posts, week after week. My former mother-in-law, Dolores Mejia, used to make these all of the time. They were always one of my favorites. So sad to see American Meat Market close. I now live in Texas and twice a year I come home to Tucson for a visit. I would always made a trip to South Tucson for tortillas and chorizo to bring home. American Meat had the best chorizo in Tucson! Yes, American Meat Market was a Tucson icon. But none of their kids wanted to carry on the business. When I lived away from Tucson, I’d always buy a few dozen tamales, freeze them, and carry them home in my suitcase. There’s a good reason Tucson was named a world class UNESCO City of Gastronomy and it has nothing to do with white tablecloths and 5-star restaurants! As I recall, he starts with fresh chiles just a little bit dried. He toasts them, then takes out the seeds and stems. They then go into a blender with enough water to make a paste. It really was good. His wife says that when they don’t have any of his fresh made sauce in the freezer, they also can use Santa Cruz red chile paste. tamale recipe and their recipe book if one is available. These gals are just two homecooks. No recipe book. But interestingly, in the four years I have been blogging, two by myself and two with collaborators, this is the most popular post by far. I think I should go back to them and do another recipe. It’s not green corn tamale season until next summer, but maybe they have something else to offer. These ladies are your neighbors in Menlo Park. They were so delicious, even warmed up later! My Nana, Carmen Bernal of Benson, AZ made these all the time and they were our family’s favorite! She passed away in January of this year (2014) and though I watched her make these many times, don’t have the exact recipe. Trying to recreate them in her honor. Good luck, Lisa. These were light and crisp. We made them in Elda’s kitchen and I took some leftovers home for my husband. Even warmed up later, they were delicious. My son calls this a vanishing dish, not because it isn’t being made, but because once it is served. It doesn’t last long on the plate. My mother-in-law, Maria Luisa Elias, use to make these for our son, Jason, who loved them. Now that I have the recipe, I can make them! Nice job, Ladies. Thank you. Aren’t these ladies great. Yesterday they were talking about what else they are going to teach me to cook! Can’t wait to try this recipe, everyone can play a part in keeping this food tradition alive. Thanks so much for posting! Elda and Armida thought it was funny this dish was considered endangered. But I don’t think the younger generation in their families is making it often. I’m going to have to try these! They look scrumptious. I wish I could have somehow attached the fabulous fragrance. Good luck with your trial. Invite lots of friends.